I am feeling very happy and very excited. I am nearly a Master Chef! Only a few months ago, I didn’t even know how to turn on the stove and now I can cook three meals by myself. 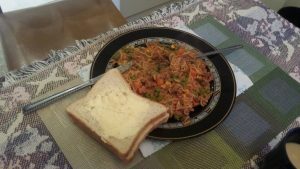 I would like to share with you my favourite, and very easy recipe for spaghetti bolognaise. I always like to make enough for two or three meals at a time so I can freeze some. Before you start cooking, make sure you wash and dry your hands. Put the element on to a high heat and add the oil. 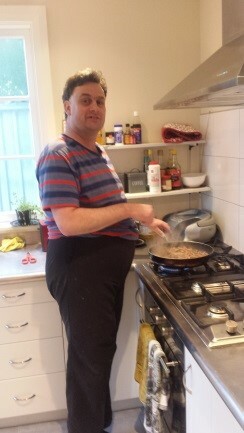 Put the mince in the pan and stir until it is all brown. Always stay in the room when you have food cooking, and make sure the handle of the pan is turned to the side or back of the stove so you can’t accidentally knock it. If you do this, the food could spill on the floor, or you could burn yourself. Add the jar of pasta sauce and stir till it has come to the boil. If you are using mushrooms, add them now. You can also add frozen vegetables if you like. Once boiling, turn the heat down low and put a lid on. Cook for 15 minutes and stir it every 5 minutes. While this is cooking, put your 2 minute noodles in a microwave jug or bowl with hot water and cook for 2 minutes. When they are cooked, drain them through a colander. Sprinkle some cheese on top if you want to. Make sure you have turned the stove off. When you have finished eating, a good chef always does the dishes and cleans the top of the stove and the benches. Yum, that’s it. Eat and enjoy!